I want a greener lawn! I’m wondering what to do here. Have my flex schedule set up so enough water goes down, and my grass grows rapidly (needs mowing >1x/week). However, it’s nowhere near as green as my neighbors’ (and one of them waters 2x/day every day)! There’s a bit of brown homogeneously mixed in and the green blades aren’t that green. Fertilizing made things grow faster but not greener. If the brown grass is an annual crabgrass, it dies each year after going to seed. If that’s the case, you need to prevent the crabgrass from growing next year. Use a pre-emergent fertilizer in the spring, timed correctly to prevent the crabgrass from germinating, and/or spray with a selective herbicide that targets crabgrasses. If the brown grass is dead desirable turf grass species, then you need to dethatch or power rake. Amazon sells electric ones for $100 that will do the job. The rotating tines loosen the dead grass and you can rake it and dispose of it. If the lawn is thin after this raking, you should put down seed. Fall is best for cool season grasses. If you miss the chance to do it this fall, you can do it in the spring, but not if you put down a crabgrass preventer, since it would also prevent the grass seed from establishing. If the alive desirable turf grass is yellow and not green, you need to fertilize. Generally you’d do spring w/ pre-emergent to prevent weeds/crabgrass from germinating and a fall fertilizer (no need for pre-emergent). These are the best times since cool season grasses grow in the spring and fall. Both lawns look to be the same color green, only the neighbor’s lawn has less dead grass. Other than fertilizing a regular amount on the spring/fall schedule, I wouldn’t change anything. @Irwhit There are companies out there that will paint your lawn green. This is the first thing that popped in my head when I saw your topic title. Real green grass is an investment. @mnwaterer has some good info. In the past, I’ve had good results with Ironite. You can’t burn your grass by over appying it, but it WILL leave rust spots on concrete if you don’t wash off spills quickly. I did crabgrass preventer last spring, so the crabgrass burden wasn’t too bad. I indeed do have a dethatcher and managed to rake a TON of dead grass out. Just put down seed last weekend. Hoping to see some new grass soon. Kinda hard to tell the difference between yellow alive grass and dead. How do you tell? Gonna try stick to fertilizing in late fall and early spring (with the pre-emergent). Does it make sense to throw down some composted manure right now to add some more organic matter to the lawn? I’ve eyed ironite. However, I’ve read that since it is derived from mine tailings that it contains heavy metals and other hazardous materials? Use a fertilizer high in Nitrogen(N) and Potassium(K). The three numbers on a fertilizer bag represent a percentage of 3 different nutrients in this order N-P-K (Nitrogen - Phosphorus - Potassium). Nitrogen increases growth and greenness, potassium helps the grass better utilize the nitrogen. Adding supplemental iron will help give your grass a darker shade of green. Milorganite. Slow release organic Nitrogen with iron should help get you going in the right direction. +1 for Milorganite. Never used it myself (as not available in the UK) but I’ve been watching a lot of this recently: https://www.youtube.com/user/LawnCareMidwest and this guy will not shut up about the stuff - he really rates it, and the before/after photos do look pretty good. I see a host of different weeds in your lawn. Fertilizer will only make the weeds stronger yet they rob the good grass of nutrients. I would recommend treating the lawn with a select herbicide (not Round up). Find a product with 2-4d in it as well as Quiclorac. Follow the directions on the bottle. Once the weeds are gone, you will now have a host environment to support good grass. I used to be a faithful user of Ironite but something has changed in their formula over that past 5 years and the way it works has been diminished. “Best” products makes a fertilizer called “Evergreen”. It contains a 15-5-0 with 5% iron. This works better @4 weeks after applying Milorgonite. It contains a non staining iron but I still exercise precautions with cement or other color coated hardscapes before applying water. Evergreen can be applied in all seasons. Yeah, weeds have really become a problem lately… Spray herbicides haven’t seemed to touch it! I did triclopyr over the summer bc of annuals such as dandelion, wild violet and ground ivy… The weeds just laughed. It’s frustrating. My grass looked similar to the original poster and I decided to follow what you posted as a solution. In Sept 17 I dethatched the lawn and got a lot of dead (weed or grass I’m not sure) out. I then used a core aerator just for good measure. Then I overseeded with sod quality seed and put a layer of peat moss down. I then used an organic fertilizer twice since, once every five weeks. The result, the grass is definitely improved, however one thing I’m noticing is that the seed didn’t take everywhere and the grass is different heights all over the whole area. Some places it’s really tall green (about 4-5 inches after 2 weeks mowing) and other places low but green. I’m not sure what was originally planted, I used tall fescue seed because it seemed to be the dominant recommendation for Southern California. In Spring I plan on putting down something for weeds, with my limited knowledge, I don’t know if what looks like grass to me could be a grass looking weed? I do have a couple of obvious weeds but the grass does seem to brown up typically in summer so I’m wondering if I have some type of annual weed grass that’s my problem? I am also a So Cal Resident. Nut grass is a common infestation in lawns. It looks close to tall fescue but actually grows extra tall inbetween mowings. You can treat it with Spectricide brand weed killer which also treats Nut Sedge unless that is the only weed then I would recommend “Sedge Hammer” brand select herbicide. Just searched for pictures of Nut Grass and it looks pretty similar. It’s been just over a month and a half since I’ve planted the tall fescue and the directions for the Spectricide you recommended indicated it should be ok to use, so I might give this a try now instead of waiting until spring. In the areas where the seed didn’t seem to take and the grass is more low lying than in other areas, I assume it should improve after the weed treatment? I’m thinking as you’ve suggested to others in your prior posts that I’ve been fertilizing the weeds and they have been robbing the grass that I want to grow of the nutrients? The Spectricide is very good for a vast variety of weeds. You can compare it to the Ortho Crabgrass Control and find out that the Ortho does not work on the Nut Sedge. The key is in the amounds of 2-4D and the Quinclorac concentration. Nut Sedge is a Monocot and needs to be treated with a selective herbicide that attacks it but not the surrounding grass. Excess weeds will steal the nutrients from the surrounding plants or turfs. The areas that you are describing as “low lying” leave suspect that there is fusarium in your lawn as well. I would treat the fusarium first as it tends to hold back even the weeds. 2 weeks after fusarium treatment, you will notice more weeds coming up as well as some nicer grass growing since it has been impeded by the fungus. Your fertilizer will work much better once everything is back in balance and the weeds and fungus are out of your lawn. Really have appreciated the help you have provided! Thought I would post an update. After taking advice from you and watching several “Lawn Care Nut” YouTube videos I think I’m making some progress! 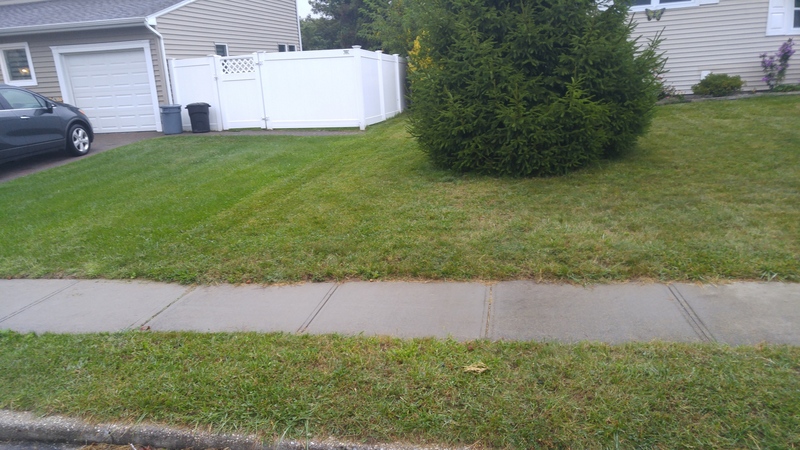 Last September I core aerated my lawn, overseeded with tall fescue and Peat moss and waited. As of March I’ve noticed a greener lawn but some areas with weeds(lighter color grass, yellow nut sedge), sprayed the Spectricide and then threw down some Milorganite fertilizer about two weeks later and it seems to be looking much better! I have an area that is exposed to the sun quite a bit that is a little more brown than the shaded areas, thinking about putting down some AquaSaver in the soil to see if that helps? Also thinking about overseeding with Kentucky Bluegrass in September, what are your thoughts? I meant to update on this as well. I applied a fusarium treatment right after your post but now that I have looked into that a little more, I don’t think I described the issue very well. What I noticed and still see today is that while the grass is all green, it just doesn’t grow at the same rate. I’ll notice a week after mowing that in some areas the grass has grown several inches and others maybe only and inch. There doesn’t seem to be any weeds or fusarium issues (brown spots). I checked to make sure the water coverage is good, it’s getting Milo and is green, it just doesn’t grow fast like the rest…not sure what’s going on…maybe a big rock/lots of palm tree roots under the surface…?